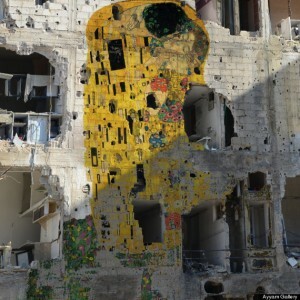 Syrian artist Tammam Azzam took the twittersphere by storm last week when he posted an image of Gustav Klimt’s “The Kiss” superimposed on the facade of a bullet-ridden building in Damascus. The photoshopped image — which some mistook for an actual street-side mural — brought the eye of the art world to the artist’s war-torn home country. Read the Full Article at Huffington Post Here!